Written in 1997, and revived on Broadway in 2014, Sideshow is a relatively new musical. The score still feels fresh and demands attention, and the story’s overarching themes are both resonant and timely. The show tells the tale of the conjoined twins Daisy and Violet Hilton, real women who were born in Brighton and went on to become two of the most well-known and well-paid performers in America during the 20s and 30s. We follow their lives from their early sideshow days to the poignant moment in which they are poised to star in a Hollywood movie, and are asked to think about what it means to be different, and to reflect on the struggle for individual agency and fulfilment. The show’s director, Dom O’Hanlon, writes that the company was ‘drawn to the Bussey Building and its alternative feel’, and it’s true that walking through the bunting-bedecked Bussey tunnel, and climbing the concrete stairs from the yard, festooned with fairy lights, couldn’t be a more perfect introduction to the sideshow spirit. Roberta Volpe’s evocative set and Adrian Jeakins’ atmospheric sound design continue the illusion; so much so that we really seem to be in the big top for the duration. Lemington Ridley’s superb costume design is also perfectly pitched throughout, and contributes enormously to our immersion in the Side Show world. Come Look at the Freaks, the powerful opening number, sets the tone for much of the work to come. The orchestra is tight and punchy, and the ensemble singing is clear and full of theatrical energy. John Reddel’s able musical direction ensures that these qualities remain throughout, and the company work is always strong enough to loft the ball back into the air on the occasions when some of the individual performances are lacking. For the most part, Katie Beudert (Daisy) and Lauren Edwards (Violet) are terrific, and carry the story with great charisma. Beudert perfectly captures Daisy’s starry-eyed effervescence, and, in contrast, Edwards has a purity of vocal quality and control which illuminates Violet’s quieter personality. Matthew James Nicholas gives a stand-out performance as Terry Connor, and moves adroitly from boyish charm in the first Act to the passionate intensity of Private Conversation in the second. There is no doubt that he has a serious Musical Theatre career ahead. Alexander Bellinfantie (Jake) is in fine voice for The Devil You Know – Act 1’s showstopper – but, frustratingly, seems physically uncomfortable on stage throughout, and Barry O’ Reilly’s Buddy, although performed with a lot of gusto, never achieves true fullness of character. Special mention though should go to both Olga-Marie Pratt and Aloña Walsh for their truthful performances in the ensemble. 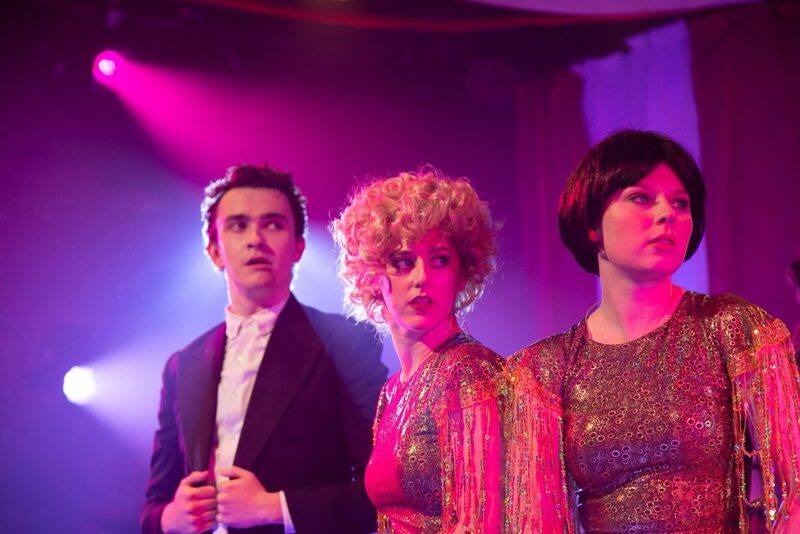 Side Show is an intriguing piece, and it is definitely refreshing to see a musical which challenges the centrality of the ubiquitous boy meets girl relationship. It is not without its flaws however; chief among them an emotionally and narratively unsatisfying ending. Pint of Wine’s production does justice to Bill Russell’s book and to the music of Henry Krieger, but it too is flawed. The choreography seems too pedestrian for the subject, and the production loses its sharpness during the dance numbers. In addition, the scene transitions involving the full company need tightening. That said, all credit must be given to Dom O’Hanlon and company for this spirited revival.